Nitrogen presents a safe and reliable solution for corrosion prevention. Corrosion can be a major issue for any industry or operating system that combines metal, moisture, and exposure to oxygen or metal exposed to acids, bases, salts, oils, solid and liquid chemicals, and some gaseous materials. Corrosion can eat right through metal, starting with pinhole leaks and leading to inefficient or inadequate operation of the system - and ultimately system failure. 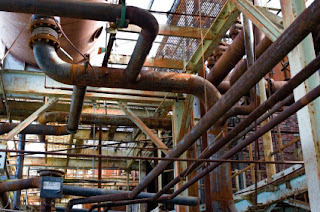 Industries at risk for corrosion include facilities such as power generating plants that utilize cooling towers or other water related cooling mechanisms as well as HVAC systems, Fire Protection Systems (FPS), chemical processing, water treatment, and more. How Can Nitrogen Prevent Corrosion? Nitrogen gas is particularly effective at preventing and inhibiting corrosion in enclosed metal vessels such as piping systems or tubing that may come into contact with moisture and also be exposed to oxygen. Prime examples of this would be the boiler tubes and condensers in power plant cooling towers and the dry or pre-action sprinkler system in fire protection systems. Submerged metal parts of cooling towers, such as boiler tubes and condensers, are at risk of exposure to oxygen during shut downs and layups. When exposed to O2, corrosion can spread rampantly if not actively prevented. Even with all the water drained, residual moisture is inevitable and corrosion can take hold from there. A solution here would be to purge all wetted parts with Nitrogen gas to eliminate the presence of oxygen and prevent the risk of developing corrosion. The most efficient way to apply Nitrogen in this situation is to use a Nitrogen Generator. This allows for a continuous N2 purge without risk of running out of gas. Dry or preaction fire protection systems are generally commercial sprinkler systems that run a supervisory gas through the pipes rather than water. The water is constrained by a valve held in place by the pressure of the gas. These systems require testing with water and inevitably residual moisture will be left behind within the pipes. This situation presents a great risk for microbiologically influenced corrosion (MIC), a form of corrosion that starts with water-forming bacteria that can spread quickly and destructively throughout the system. Using Nitrogen as the supervisory gas in dry or preaction FPS eliminates the threat of MIC corrosion by eliminating the presence of oxygen - one of the elements necessary for oxidation (corrosion). As with power plants, a Nitrogen Generator is the most efficient, reliable, and effective method for applying N2 gas in a steady, continuous supply as needed. A Nitrogen Generator supplies high purity N2 gas on-site and on-demand with easy operation and minimal upkeep. South-Tek Systems is an engineering and manufacturing company dedicated to Nitrogen Generators. They create systems for a wide range of industrial applications as well as military, food and wine, nitrogen tire filling, and more. Contact South-Tek Systems today to learn how a Nitrogen Generator can help your business prevent corrosion and costly repairs and replacements: 888-526-6284. Corrosion poses a major threat to any metal object that is exposed to both moisture and oxygen. This goes for metal piping, a metal protective covering or encasement, a metal roof - anything made from metal that is exposed to the elements. 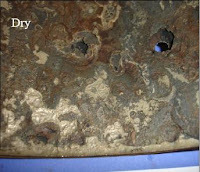 The contact of both moisture and oxygen with the unprotected metal starts the corrosion process, also known as oxidation, that can create pinhole leaks in the metal and, ultimately, cause deterioration and breakdown of the object. Corrosion prevention is essential to the performance of the metal substance, assuming it serves a useful purpose such as conveyor and/or protector. Without corrosion prevention, an operator is at risk of timely and expensive repairs to the object - whether it be a pipe, an encasement, or a roof - and is potentially looking at complete shut-down of operations while the repairs (or full system replacement) are made. A reliable solution to corrosion prevention comes in the form of Nitrogen gas. Nitrogen is found naturally in the air all around us and, when isolated, serves as a dry, inert gas that can eliminate the presence of oxygen in an enclosed vessel such as a piping system designed to convey water. A Nitrogen Generator can supply literally endless amounts of N2 gas at the appropriate output level needed for a particular application. It uses a simple PSA Generator or Membrane Technology to isolate Nitrogen from the air around us. The high purity N2 gas is stored in an attached storage tank and hooked up to the gas line for use. A Nitrogen Generator eliminates any worry of running out of N2 gas or of handling high pressure gas cylinders. How Can Nitrogen Help With Corrosion Prevention? Dry or Pre-Action Fire Prevention System (FPS) - a dry or pre-action FPS is designed with a valve that keeps water out of the piping. The valve is held in place by the pressure of supervisory compressed air pumped through the system. When the system's temperature gauge registers enough heat to release the compressed air, the decreased pressure allows the valve to release and send water through the pipes to the sprinkler heads. This type of system is susceptible to corrosion because of the moisture that stays behind after system testing or operation. This moisture combined with the compressed air within the metal piping will is enough to start the corrosion process. Using Nitrogen as the supervisory gas in a dry or pre-action FPS instead of oxygen is extremely effective in corrosion prevention. The MICBlast Corrosion Inhibiting System with an internal Nitrogen Generator is specifically designed for FPS corrosion prevention and can help ensure that an FPS can void pinhole leaks caused by microbiologically influenced corrosion (MIC). Power Plants - Power plants utilize boiler tubes and condensers that are often made of metal and exposed to moisture. During a layup or plant shut down, these wetted parts can be drained but residual moisture inevitably remains and, with the exposure of oxygen, the process of corrosion immediately begins. A Nitrogen Generator can produce Nitrogen for power plants at a fraction of the cost of using high pressure cylinders. Plus, N2 gas can be generated on-site and on demand without risk of running out. This is extremely beneficial for the power plant industry who can face high risks and costly repairs due to corrosion. South-Tek Systems is a leading Nitrogen Generator manufacturer and maker of the MICBlast Corrosion Inhibiting System for FPS as well as the N2 Series for industry and other Nitrogen Generator Products. Contact South-Tek Systems today to learn how a Nitrogen Generator can help your business with corrosion prevention: 888-526-6284.